The Central Valley Flood Protection Plan (CVFPP) is a critical document to guide California’s participation (and influence federal and local participation) in managing flood risk along the Sacramento River and San Joaquin River systems. The CVFPP proposes a system-wide investment approach for sustainable, integrated flood management in areas currently protected by facilities of the State Plan of Flood Control (SPFC). The CVFPP will be updated every five years, with each update providing support for subsequent policy, program, and project implementation. 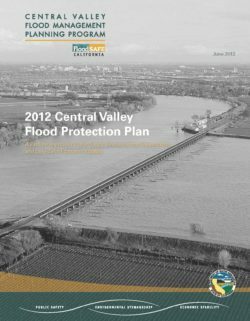 The State of California (State) conducted planning and investigations for the 2012 CVFPP from 2009 through 2011, representing the most comprehensive flood evaluations for the Central Valley. Following the anticipated adoption of the CVFPP in 2012 by the Central Valley Flood Protection Board (Board), preparation of regional- and State-level financing plans will guide investments in the range of $14 billion to $17 billion during the next 20 to 25 years. These financing plans are critical to CVFPP implementation, given the uncertainty in State, federal, and local agency budgets and cost-sharing capabilities. 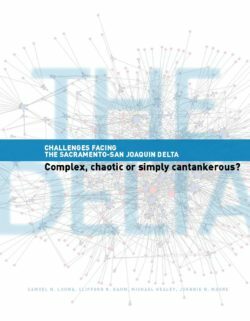 Challenges Facing the Sacramento-San Joaquin Delta: Complex, Chaotic, or Simply Cantankerous? beneficial and minimize adverse outcomes. In this context, the following paper calls for Delta management to become more nimble and better coordinated. 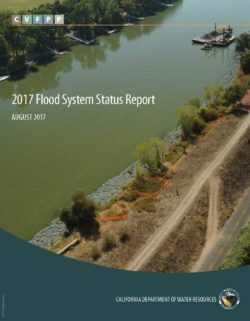 In the California Sacramento-San Joaquin Delta (Delta), levee failure could cause catastrophic flooding, potentially causing injury or loss of life, and possibly damaging property, water supply, infrastructure, and environmental resources of importance to the entire State of California (State). Though levee maintenance and improvements over the past three decades have reduced the frequency of levee failures, the State has no comprehensive method to prioritize its investments in Delta levees operations, maintenance, and improvement projects. The Delta Plan, adopted on May 16, 2013, recommends that the Delta Stewardship Council (Council), in consultation with the California Department of Water Resources (DWR), the Central Valley Flood Protection Board (CVFPB), the Delta Protection Commission (DPC), local agencies, and the California Water Commission, implement California Water Code (CWC) section 85306 by developing a Delta Levees Investment Strategy (DLIS) to identify funding priorities for State investments in Delta levees. The DLIS is an innovative approach for determining priorities for State funds for levee improvement in the Delta and Suisun Marsh. The DLIS, which considers the assets protected by levees, the threats to levees, and the multiple beneficiaries of levee investments, uses a risk analysis methodology to recommend priorities for State investments in levee operations, maintenance, and improvements. This methodology was developed in close coordination with State agency partners, local and regional flood management and emergency response planning agencies, and other interested parties. In total, the Council worked with 113 different stakeholders and conducted 10 public meetings, 60 stakeholder outreach meetings, and 60 interagency coordination meetings. The Council also discussed DLIS issues at 38 Council meetings and workshops, which provided opportunities for public comment. The DLIS team developed a Decision Support Tool (DST) to enable the Council and stakeholders to review and update the data and analysis that form the basis of the risk evaluation. The DST supports deliberations by summarizing information about baseline and future risks, aggregating and displaying risks, and then identifying portfolios of investments that have the potential to reduce risk to State interests. The data components in the DST are designed to be updated as new information is collected or identified. Levees in California’s Sacramento-San Joaquin Delta (Delta) reduce flood risk to people, property, natural resources, and infrastructure systems of statewide importance. Levee failure (such as a levee breach) could cause devastating flooding, potentially resulting in injury or loss of life, damage to property and infrastructure, disruption of water supply, and harm to environmental resources of statewide significance. Currently, the State of California (State) does not have a long-term strategy to guide future investments of its limited funding for Delta levees. 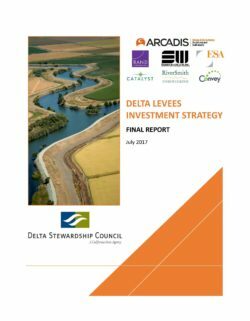 The 2009 Delta Reform Act directed the Delta Stewardship Council (Council) to lead the effort to develop and recommend priorities for State investments in Delta levees to reduce flood risks and to advance the coequal goals of water supply reliability and restoring the Delta ecosystem. Working closely with other agencies and the public, the Council is developing a Delta Levees Investment Strategy (DLIS) to establish priorities for State investments in the Delta levee system. 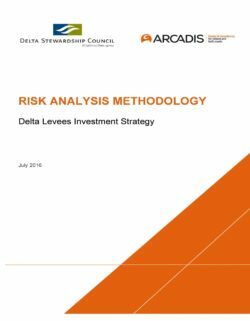 As presented in this report, the DLIS is based on a comprehensive methodology that quantifies risk by considering the threats to Delta levees and the assets protected by Delta levees. The DLIS also considers the multiple beneficiaries of Delta levee investments. Building on the results of previous Delta levee planning efforts, the DLIS collects and uses the best available existing data and information from numerous sources to evaluate risks to State interests in the Delta as defined by risk to public safety; property and infrastructure; water supply reliability; the Delta ecosystem; and the unique attributes of the Delta as an evolving place. The DLIS evaluates those risks under current and potential future conditions. In early 2015, the DLIS team prepared an Interim Progress Report summarizing the work conducted during the first 9 months of the DLIS project. The report focused primarily on the methodologies planned for implementing the DLIS project to facilitate a “mid-course” review by an independent science panel, which completed its work in July 2015. Panel members offered comments for improvement and concluded that the “overall methodology of using existing data, identifying important metrics, aggregating results, and making comparisons across islands is conceptually sound” (Mitchell et al. 2015). The DLIS project includes outreach to State and local agencies, concerned stakeholders in the Delta, knowledgeable technical resources, owners and operators of Delta infrastructure, and Delta leaders and residents. The final methodologies employed in the DLIS project are reported herein and incorporate the input from the independent science panel as well as feedback and comments resulting from the outreach efforts. 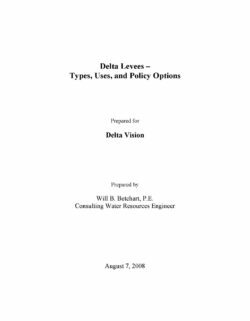 This document was developed to support Delta Vision discussions on the role of levees in the Delta’s future. It is to clarify the different types (or design standards) of levees that now exist for the Delta and what improvements could be considered. It is especially oriented toward an improved understanding of what types of levees are suitable for protecting various land uses or for other applications. Based on understanding the levee types, policy options are identified for a) selecting levee improvements to be included in the vision of the Delta’s future and b) implementing the improvements selected. 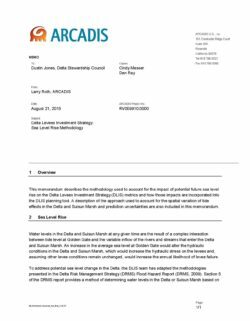 This memorandum describes the methodology used to account for the impact of potential future sea level rise on the Delta Levees Investment Strategy (DLIS) metrics and how those impacts are incorporated into the DLIS planning tool. 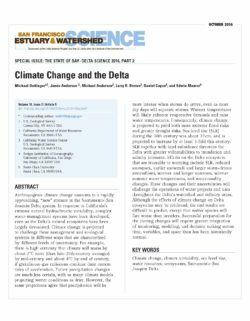 A description of the approach used to account for the spatial variation of tide effects in the Delta and Suisun Marsh and prediction uncertainties are also included in this memorandum. 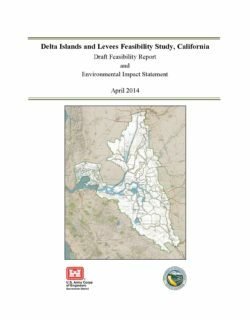 This report explains the financing of the 93 reclamation districts that maintain the Delta’s levees. Reclamation districts’ primary method for raising funds is through assessments, which are levied on a per-acre basis upon property owners within a district’s boundaries. Assessments are subject to Proposition 218 procedures, and they must be approved by a vote of the affected people. A second financing tool that reclamation districts have is charging fees for services, such as irrigation or drainage services for landowners. In addition to relying on these direct financing tools, reclamation districts can also receive funds from the State or from other entities. According to data from the State Controller’s office, the median Delta reclamation districts have annual budgets of around $370,000, with property assessments serving as the primary source of revenue. Typical assessments in these districts are about $32 per acre. State funding is a supplementary source of revenue for these districts, making up about 30 percent of total revenues. On the expenditure side, more than 80 percent of typical reclamation districts’ expenditures are for “services and supplies,” which includes levee work, but also other expenses. Only 12 Delta reclamation districts have long-term debt, so State funding appears to have been successful in helping Delta reclamation districts avoid overly burdensome debt levels. The State has concentrated its reclamation district funding on certain strategic islands. Ten reclamation districts have received 62 percent of state funding over the past five years. These 10 reclamation districts that receive the most state funding also tend to have much higher property assessment rates compared to other reclamation districts. 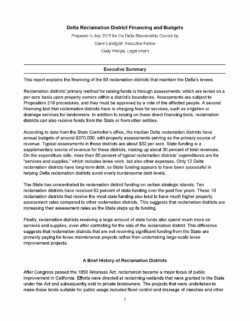 This suggests that reclamation districts are increasing their assessment rates as the State steps up its funding. Finally, reclamation districts receiving a large amount of state funds also spend much more on services and supplies, even after controlling for the size of the reclamation district. This difference suggests that reclamation districts that are not receiving significant funding from the State are primarily paying for levee maintenance projects rather than undertaking large-scale levee improvement projects.